Over the last few hours, I’ve read some interesting posts on different blogs, all claiming that Google AdSense has lifted the limit of 3 Ad Blocks on a page. So I ask myself if this is true, it is going to be a big relief for me and thousands of publishers who own blogs where web pages are longer and can certainly fit more ads than the prior limitation of just 3 Google Ads slots. Google hasn’t directly told publishers about the removal of the limitation but chose to quietly update their policy where the Ad limit was mentioned. 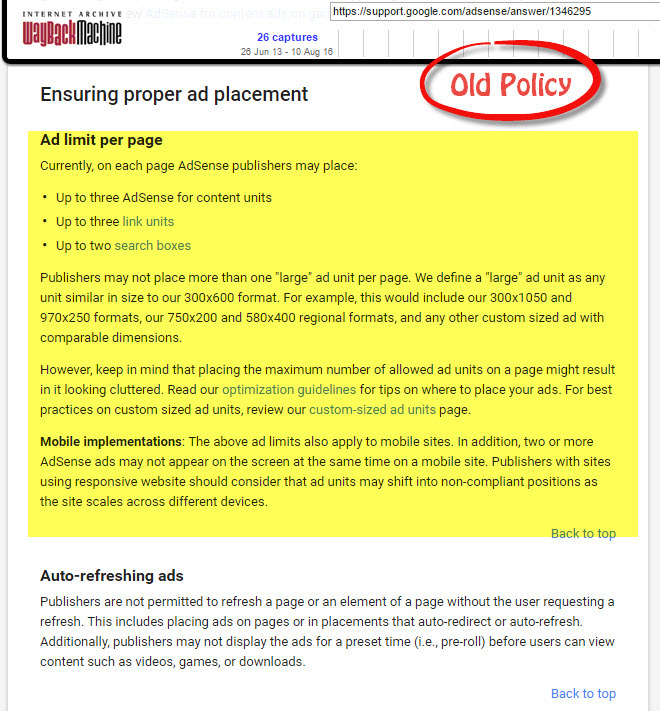 Let’s take a look at the older policy, I’ll attach the screenshot of the older policy below that I got from waybackmachine.com. 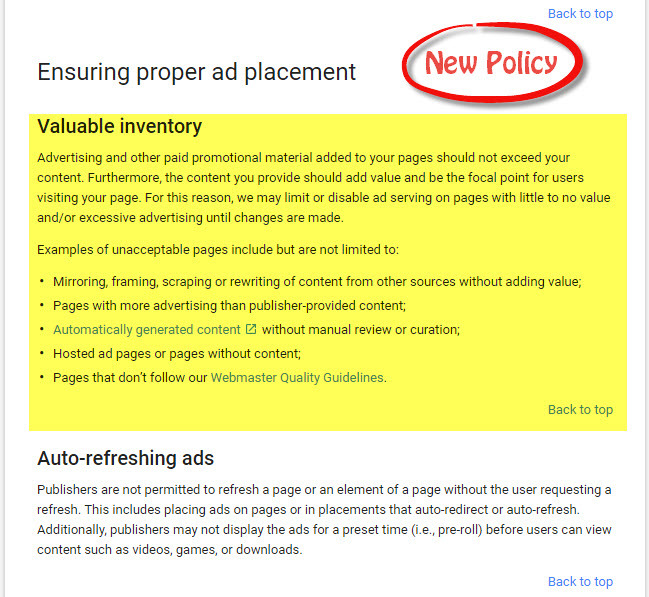 Here is the screenshot of the new AdSense Policy. Notice that only one point has changed between the two policy that’s above Auto-refreshing ads section. After this change came to notice, a lot of people have started asking questions in the Google AdSense Forum but no one from Google has responded and specifically mentioned about the removal of the Ad limit. They have recently introduced Matched Content and now they fill it with Ads, giving Publishers an option to put Native Ads like Taboola and Outbrain. And a lot of publishers were using ADEX (Ad Exchange) that allowed users to put two more Ad Slots on their site that were sold to third party advertisers. Where ADEX is only for publishers with a huge number of visitors and longer web pages of content. Small Publishers like me also have web pages that can easily fit in more Ads. In fact, many such publishers turn to other Advertising Services like InfoLinks, Media.net etc. for extra revenue. 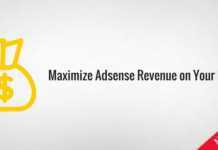 This change is certainly going to help Publishers make a little extra as Google AdSense is the best-paying Ad Platform on the web. Important: Don’t go out and put a lot of ads in your content just because a few pages on your site are longer. There may be many more pages with less content where the Ads would outgrow the real content which could get your Account in trouble. Despite all this, more ads do not guarantee more revenue. 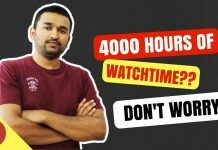 As we have written some detailed posts where we have mentioned that you can actually earn more by putting fewer ads. More Ads can decrease your overall RPM (Revenue Per 1000 Impressions) and the CTR (Click Through Rate) can also go down resulting in less revenue. So, it’s about experimentation and testing Ads and Ads placements to get the optimum results. Let us know in the comments section what do you think about this change, and are you going to put more ads on your blog or wait for the official confirmation from Google that the Ad limit has been removed. There is one point everyone seems to be missing. What this means is that you can not place even 3 Ads when the content on a page is less. I’ve seen a lot of blog posts lately that just embed a YouTube video write two lines just to fill up and put every possible Advertisement they got approved for. 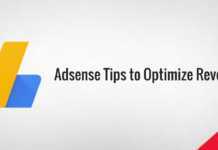 Google’s new policy will now consider this and disable Adsense on pages that have more ads than the content. That’s an interesting point, Alex. I know you are talking about those viral blogs. Considering your comment, this policy update makes more sense now. 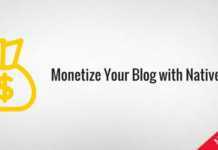 It will help publishers who spend a lot of time to create good content. Thanks for pointing it out. Fixed it now. Thanks for your comment. 🙂 Appreciate it. well i dont think google will allow webmaster to place as many as they want to, it still would be more open but balance approach. Btw, thank for sharing i got few good piece of information from this post.